An Edge cabinet has superior structural integrity because it fits together like a puzzle, which exponentially increases its strength. End panels, tops, bottoms and backs are all held securely in place by captured grooves. Standard plywood construction adds even more strength to our story, for sturdiness that you can rely on for a lifetime. Depending upon the style selected, door and drawer fronts may be ¾” thick solid raised panels or solid flat panels. All door styles include drilled stemmed bumper pads. 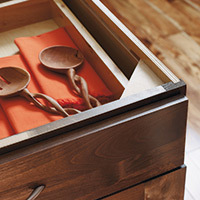 Drawer backs and fronts are 5/8" nominal thick solid wood with dovetailed corner construction. Uses a four-sided drawer and dovetail joinery for superior stability and drawer box strength. Advanced synthetic-based glue is applied to the tenons of all dovetails for even greater stability and box strength. The drawer bottom is 1/4" veneer plywood and is fully captured within the four sides of the drawer box. Capturing the bottom on four sides provides stronger drawers and rolls trays with greater structural integrity for optimum load capacity. Drawer sides, backs and fronts, and bottoms receive a high quality appearance resulting from fine sanding, sealer application, sealer sanding, and top coat application. The result is a smooth, protective shield for the drawer box. Roll tray box sides, backs and fronts are 5/8" nominal thick solid wood with dovetailed corner construction. Locking devices provide automatic latching, easy release for drawer removal and tool-free height adjustment. Quiet gliding permanently lubricated, synthetic rollers deliver a lifetime of smooth, trouble-free operation. 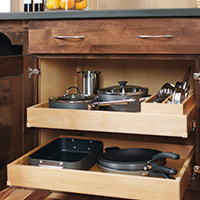 The drawer/roll tray system’s Smart Stop™ feature adds an extra measure of convenience. 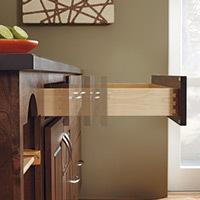 The Smart Stop™ feature engages when the drawer/roll tray is 2" from closing. Resistance is applied to the self-closing mechanism, giving a gentle, controlled closing. Parallel-closing design ensures proper alignment. 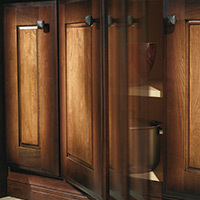 *Most, but not all, cabinet doors, drawers, roll trays and pull-outs feature our Smart Stop™ closing mechanism. Consult your designer to identify if there are exceptions in your cabinet order.